We caught up with Jeff Elliott who spends a great deal of time on the water as a fisheries biologist. Jeff has a passion for fishing and is well known in the angling community of Michigan. He was taught how to fish from his own Dad and Grandpa and fishing has become part of of his life. The Rod Glove Pro Staff Jeff Elliott is fishing the waters of West Michigan looking for the winning bass in the D & R Sports Series. Jeff has a competitive nature and always wants to catch the big ones whether out fun fishing with a buddy or in a tournament situation. 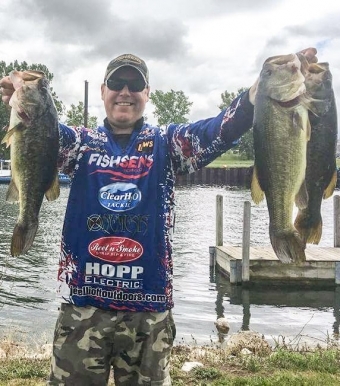 He participates in the Grand River D&R Sports Series which has been growing in popularity in Michigan and draws a large amount of boats, at times up to 60 anglers. With payouts of 2k at every tournament, there is a an incentive to reach the top 10 in every event. Jeff is fishing the West Michigan Bass Division and recently just placed 3rd which will increase his overall standing this season. Both him and his tournament partner plan on having a strong finish this year to maintain their top overall position. Jeff explains exactly why he likes The Rod Glove products in the following video. Fishing in West Michigan, the DNR Tournament Series, I use The Rod Glove to protect my gear. I know that my rods will be protected by the best product in the industry and I will be more organized and most importantly in a tournament situation, tangle free. Part of my seminar is about proper rod and reel protection as I am a firm believer in protecting your investment. At the end of each event, The Rod Gloves are distributed to the women through a draw.